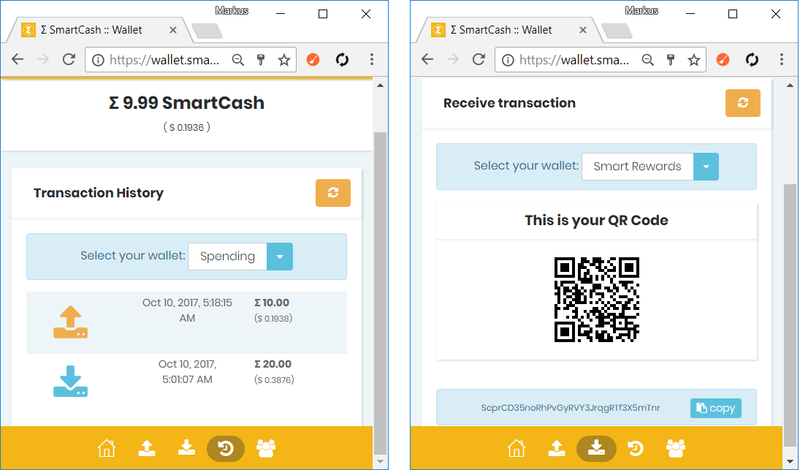 SMARTCASH'S BETA WEB WALLET IS NOW LIVE! If you don't know what SmartCash is yet, click HERE! Signing up is super-easy! All you need is a username and password basically. Once you sign up, a text file which wil contain your addresses, private keys and security id will be automatically downloaded. Make sure you hold on to this file and store it somewhere safe as this will be necessary to recover your account in case you lose your password! NO NEED TO DOWNLOAD THE WHOLE BLOCKCHAIN! One of the amazing things about this web-based wallet is that you don't have to download the whole blockchain! Neither do you have to worry about synching your wallet or updating the software. Access to your SMART coins becomes super easy as a result and you can even login and spend them on your phone without any hassle! You can easily transfer SMART coins out of the wallet or receive SMART coins by choosing your address whether it'd be spending or smart rewards, and then scan the QR code with the appropriate app which will then copy your address into the clipboard. You can easily browse your transaction history as you can see below. Not only that, but you can also easily become eligible for Smart Rewards by depositing into your Smart Rewards address and not withdrawing from the 26th of each month 07:00 UTC until the 25th of next month 07:00 UTC. The current amount of rewards for SmartCash holders is estimated to be around 24%. You can have a look at the chart by clicking HERE. SMART REWARDS ROUND 1, ROUND 2, AND ROUND 3! THE SMARTCASH COMMUNITY NOW HAS A SLACK TIPBOT/WALLET! THE SMARTCASH COMMUNITY NOW HAS A TWITTER TIPBOT/WALLET! SMARTCASH HOLDERS GOT 400% IN REWARDS IN THE FIRST MONTH! @forykw has 105 SMART (unconfirmed: 0 SMART). Holy mother! That's amazing! checking... webwallet! 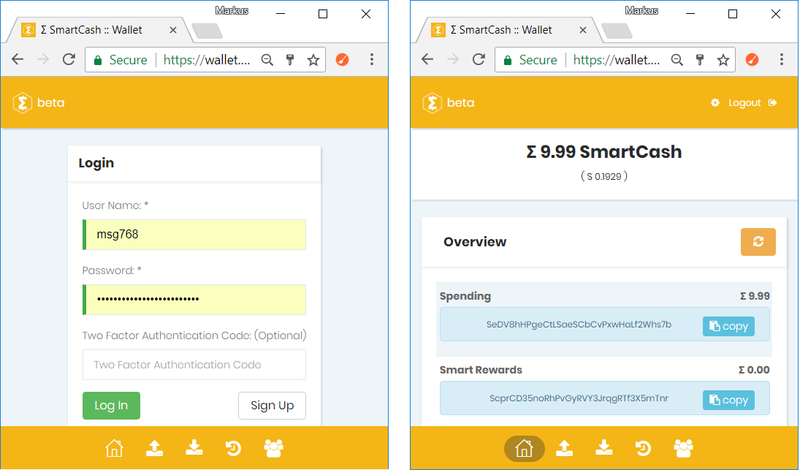 Go #teamaustralia, the beta wallet for #smartcash looks functional and easy to use. If I get tipped I be sure to download the wallet or I wait until it comes onto @coinspot. Not sure, but I am buying some. Just in case this goes to Bittrex! WebWallet looks very neat! Would love for the Qt wallet to be like that! I was hoping for that answer. Thanks! @forykw: 104.99 SMART has been withdrawn from your account to SdAPFqeGS128Nj5EzGvXivojzE2oxBndi3. You have been charged 0.01 SMART withdrawal fee. Transaction 7ce16a8ed744be3776b2fbb65e63d6c233f32381ed69b0ba4ac1a902411dcdca is now completed. Works.... love to test stuff! Congratulations! This post has been upvoted from the communal account, @minnowsupport, by forykw from the Minnow Support Project. It's a witness project run by aggroed, ausbitbank, teamsteem, theprophet0, someguy123, neoxian, followbtcnews/crimsonclad, and netuoso. The goal is to help Steemit grow by supporting Minnows and creating a social network. Please find us in the Peace, Abundance, and Liberty Network (PALnet) Discord Channel. It's a completely public and open space to all members of the Steemit community who voluntarily choose to be there. Wow, great news. Nice to see the projects rolling out for SmartCash, by the 25th another SMARTRewards Payment. I will be looking to accumulate more. Cannot wait for the Smartnodes. 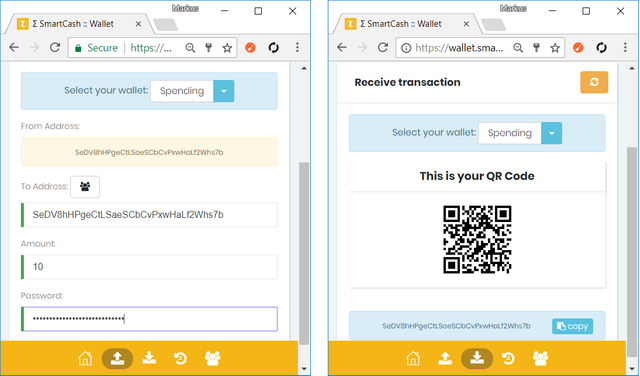 Congratulations Smartcash for the new webwallet, great work! Tipped @adnanrabbani 50 SMART! Comment @smartbot help to claim. Currently the price of SmartCash in the market is $0.021 USD per SMART. To find out more about SmartCash, please visit https://smartcash.cc. @adnanrabbani has 50 SMART (unconfirmed: 0 SMART). wow that's something great. thanks for the smartcash tip friend.